The synovium, also referred to as the synovial membrane, is the soft tissue that lines the spaces of diarthrodial joints, tendon sheaths, and bursae. The synovium lines the entire inner surface of the joint, except where the joint is lined with cartilage. The synovium has an outer layer (subintima) and an inner layer (intima). The cells of the intima are called synoviocytes. There are two types of synoviocytes, type A (macrophage-derived) and type B (fibroblast-derived). The subintima consists of intra-articular (within the joint) vessels, such as blood vessels and lymphatic vessels, and nerves. Underneath the layer of synoviocytes, there is either adipose tissue or fibrous tissue. 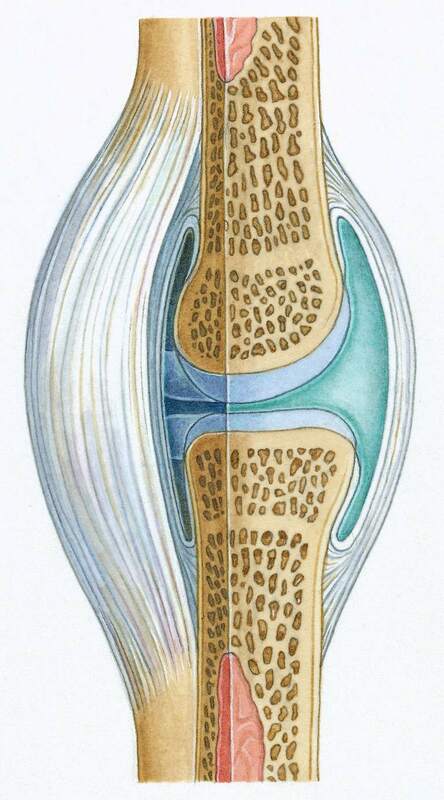 The synovium is where synovial fluid is produced, the substance that lubricates and nourishes the cartilage and bones inside the joint capsule. Like many other rheumatic diseases, rheumatoid arthritis is an autoimmune disease. In an autoimmune disease or condition, a person's immune system, which normally helps protect the body from infection and disease, attacks their own joint tissues for unknown reasons. In rheumatoid arthritis, immune system cells travel to the synovium and initiate inflammation (synovitis). The inflammatory process is characterized by the proliferation of synovial cells, increased vascularization, and the infiltration of tissue by inflammatory cells, including lymphocytes, plasma cells, and activated macrophages. This manifests itself as typical symptoms of rheumatoid arthritis—warmth, redness, swelling, and pain. As rheumatoid arthritis progresses, the inflamed synovium invades and destroys the cartilage and bone of the joint. The surrounding muscles, ligaments, and tendons that support and stabilize the joint become weak and unable to work normally. These effects lead to the joint pain and joint damage typically seen in people with rheumatoid arthritis. Understanding what happens to synovium in rheumatoid arthritis helps you to understand symptoms and disease severity. Treatments to Target Inflamed Synovium - Is It Coming? There has been interest among researchers regarding the development of tissue-specific treatments for rheumatoid arthritis. Potentially, drugs could target the synovium with increased efficacy while having decreased systemic toxicity. If this were indeed do-able, imaging agents could theoretically be delivered to the synovium, allowing for an assessment of active synovitis in multiple joints. While there have been advancements in this area, a specific synovial receptor has yet to be discovered. Freemont, Anthony J. The Pathophysiology of Cartilage and Synovium. British Journal of Rheumatology. 1996;35(suppl.3):10-13. Garrood T. and Pitzalis C. Targeting the Inflamed Synovium. The Quest for Specificity. Arthritis and Rheumatism. April 2006. Kelley's Textbook of Rheumatology. Ninth edition. Firestein et al. Biology of the Normal Joint. Pages 8-10. O'Connell, John X., MB FRCPC. Pathology of the Synovium. American Journal of Clinical Pathology. Smith, Malcolm D. The Normal Synovium. The Open Rheumatology Journal. 2011;5:100-106. Active Synovitis Vs. Subclinical Synovitis – What's the Difference?